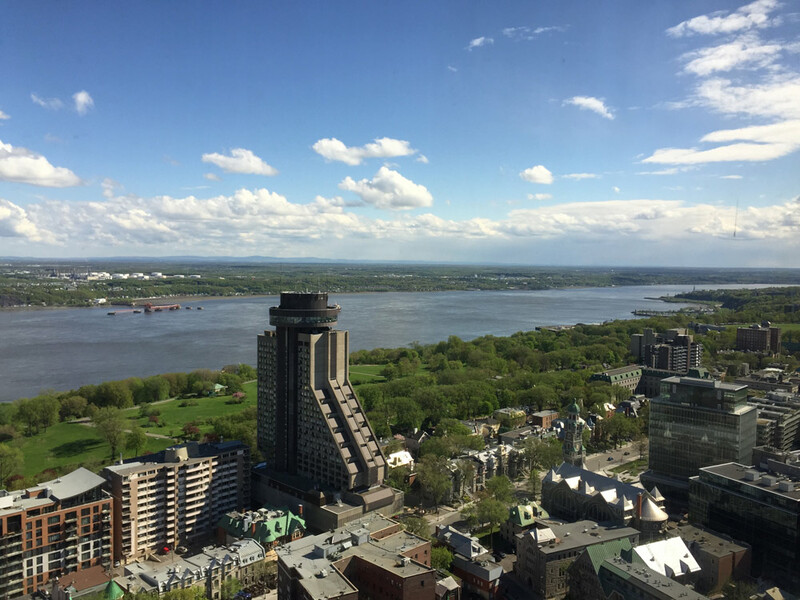 From the windows out toward West, you can get a great view of St. Lawrence River. The oddly shaped building in the foreground is the Hotel Le Concorde Quebec, which houses Ciel! – a revolving restaurant (which unfortunately we have not had a chance to visit). But the Observatoire de la Capitale is more than just a viewing deck. It also offers you a great tour of the city from up above, and a rich history lesson of the region. As you walk along the floor to ceiling windows, look for display panels that give you the opportunity to explore in more detail the landscape stretching in front of you. 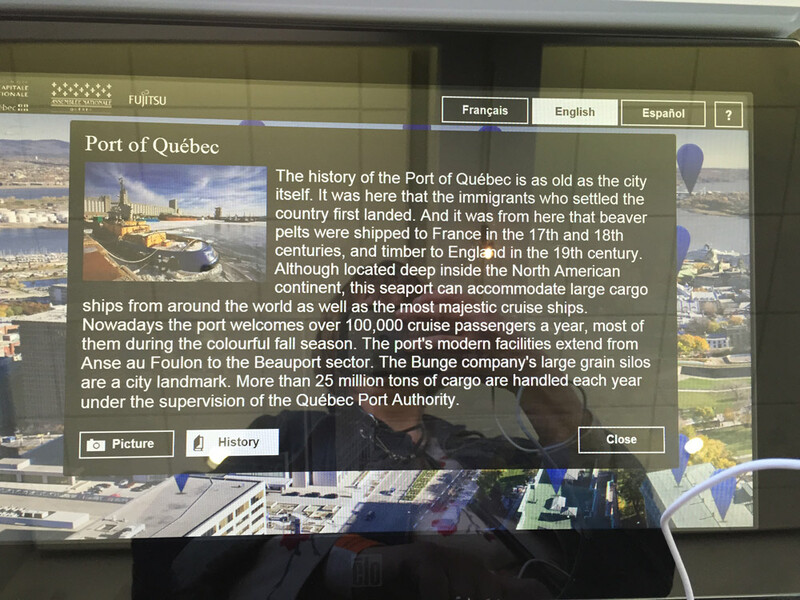 The touch screen panels with information in French, English, or Spanish, reflect the view below, with blue markers indicating landmarks for which more information is provided, when touched. From the page about “Fortifications of Quebec,” for instance, you can find out that “Old Quebec is the only inhabited urban neighborhood in North America surrounded by fortifications” and that the first fortifications were started in 1691, at the request of Governor Louis de Buade de Frontenac. The page about “Place Royale,” on another hand, informs the visitors that this oldest square and marketplace in Quebec City was named “Place Royale” after a bust of King Louis XIV was erected there in 1686. 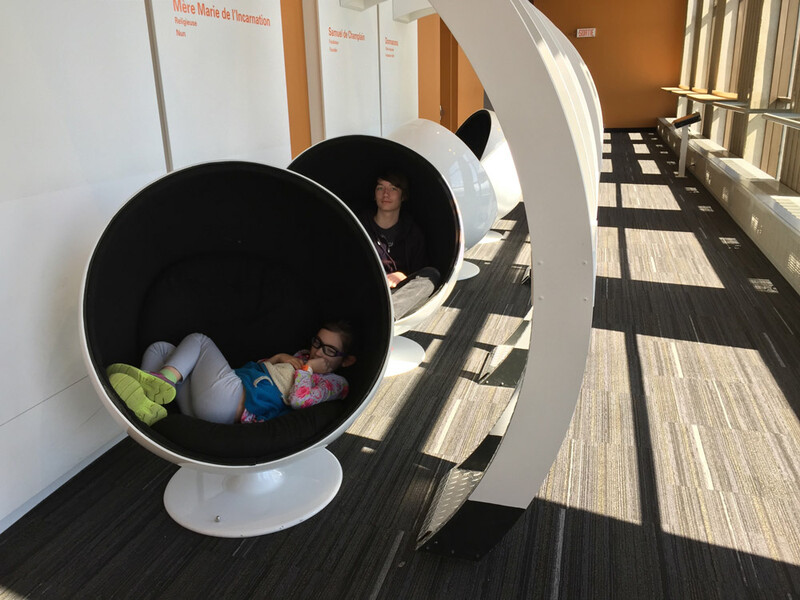 If you are not in a hurry, take time to sit down in the comfortable, egg-shaped seats along the wall and listen to brief (2 minute) audio stories “told by” Quebec region’s important historical figures, such as the Iroquoian Chief, Donnacona, or the founder of Quebec City, Samuel de Champlain. There are several of them, so be prepared to spend quite a bit of time there, if you want to listen to all. Another panel explains the reason why houses in Quebec City were built of brick with sheet metal roofs – the devastating fires that destroyed whole neighborhoods. To reduce the risk of fire, the houses were built with brick walls and sheet metal roofs. And yet another board informs the visitors that while in the mid-19th century half of the population worked in the shipyard, toward the end of the 19th century, Quebec City’s industry included clothing and shoe factories and that during World War I, the Lower Town factories produced around 25,000 pairs of shoes a week. 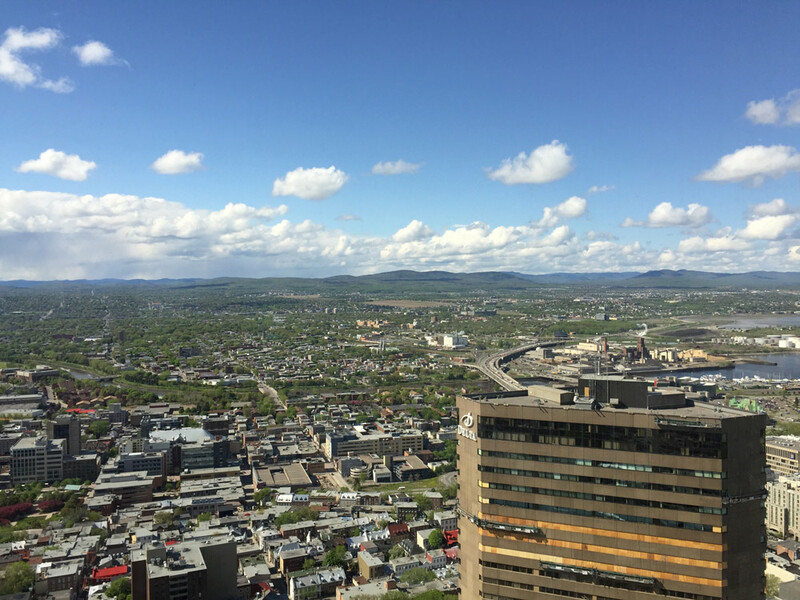 The Observatoire’s web site claims, “By the time the trip is over, you will never look at Québec City the same way again” and they’re right. If you take time to listen to all the stories, and read all the panels, you will get a much richer understanding of the city stretching in all directions underneath your feet. By the way, the Édifice Marie-Guyart, the building that houses the observatory, is only 132 m (433 ft) tall, but it’s situated in the higher area of Quebec City (Parliament Hill), that’s why the brochure says the viewing deck is at 221 meters – it’s 221 meters above the sea level. Édifice Marie-Guyart was built in 1972, and the lower floors of the building house several ministries. The observatory itself opened in 1998, and admits around 70,000 visitors a year. 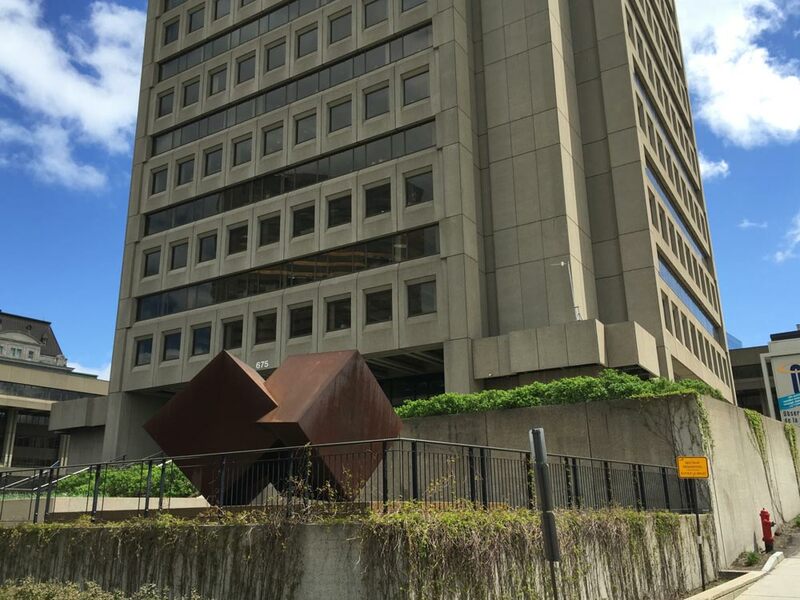 As you leave, (or as you enter), take a look at the rusty cubical sculpture “1=1+1” by Charles Daudelin on the northern side of the building. Quite simple, but also quite striking. I liked it a lot! The Observatoire de la Capitale is open every day from 10 a.m. to 5 p.m. between February 1 to (Canadian) Thanksgiving (mid-October), and from 10 a.m. to 5 p.m., Tuesday to Sunday between (Canadian) Thanksgiving (mid-October) to January 31. Evening or early morning access for groups is available by reservation. 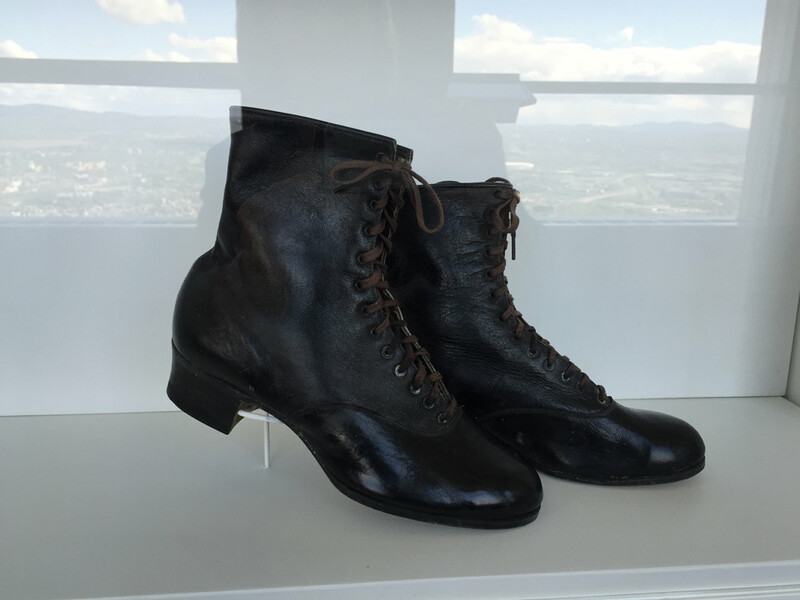 By the way, you can also book the Observatoire for events. The rates are not listed on their website, so I have no idea how expensive that would be, but it sure would be quite impressive to host a party there! Observatoire de la Capitale is located at 1037 Rue de la Chevrotière. The closest bus stop, where buses # 3, 10, 11, 25, 28, 37, 65, and several others stop, is just a few steps away on Boulevard Rene-Levesuqe E.
You can search for the right bus, and the right schedule on the Réseau de transport de la Capitale website. If you can’t go to the Observatoire de la Capitale in the near future, you can at least see the view through their webcams. Note the “search | find a point of interest” feature on the right. If you click on that, little blue dots pointing out the most important buildings appear over the image. You can follow the Observatoire de la Capitale on Facebook, and look at their collection of photos on Flickr. 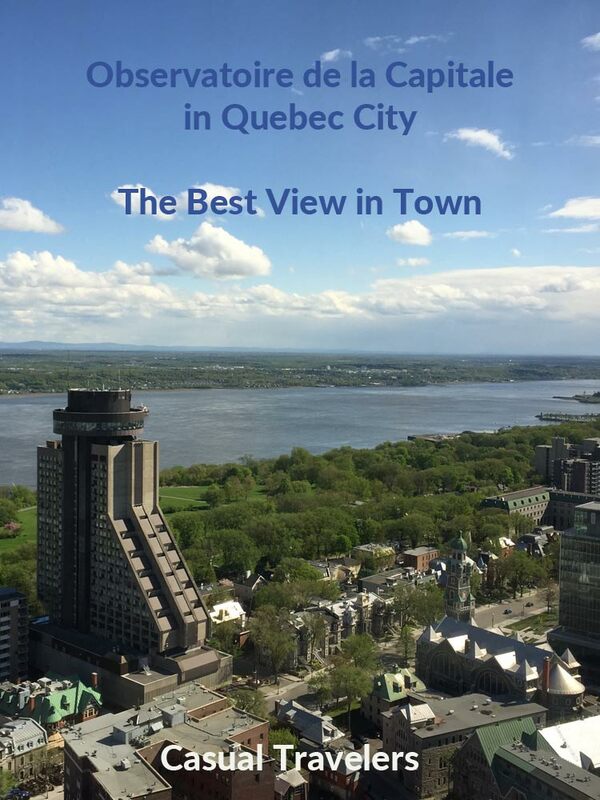 We wish to thank the Québec City Tourism Office for providing us with press passports to several city attractions, including the Observatoire de la Capitale. 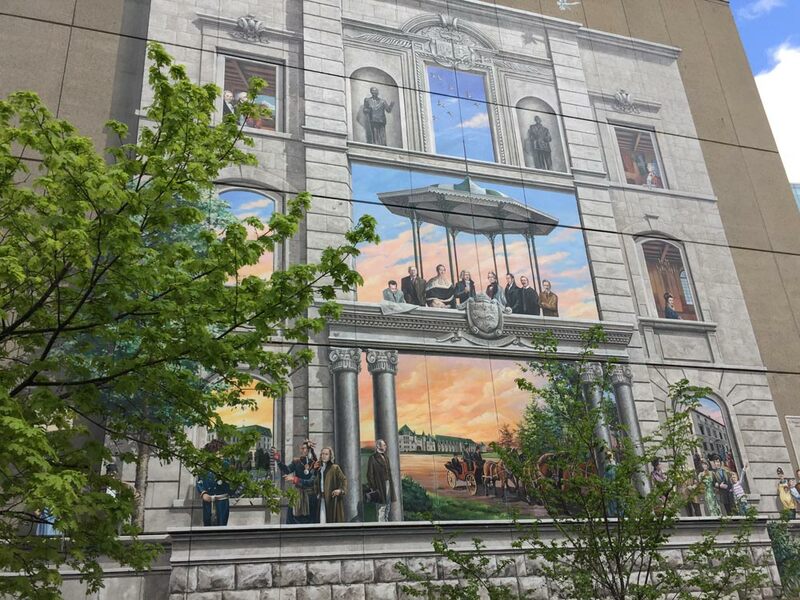 While we were guest of the Québec City Tourism Office at this attraction, the format of the article and all opinions are ours. By the way, the Office du tourisme de Québec / Québec City Tourism is present on Facebook, Twitter,YouTube, Pinterest, and Instagram. Give them some love by following them! We stayed at Le 760 Honore Mercier Apartment 604 when we visited Quebec City (click on the link to see our review of this place). You can book it, as we did, through Booking.com. Or, you can stay at one of the other hotels, B&Bs, hostels, or apartments available in that great city. There are plenty to choose from. 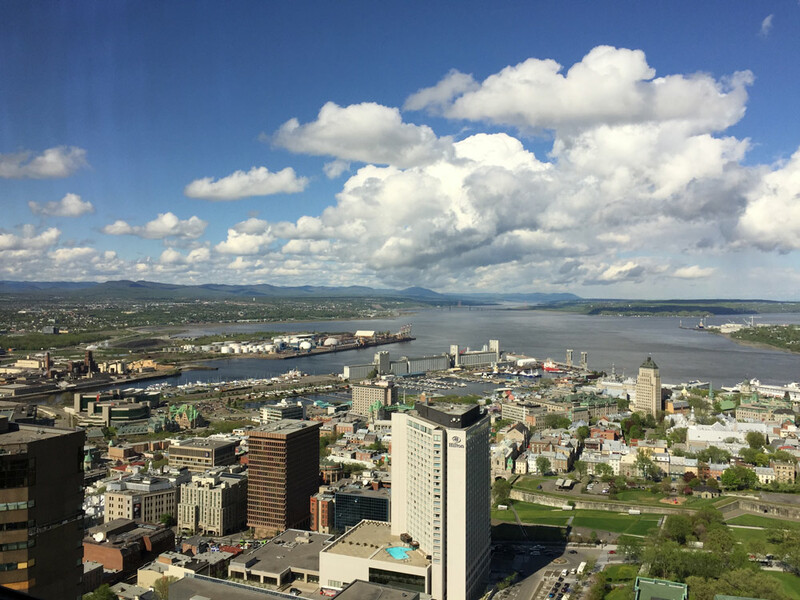 If you’re planning a trip to Québec City, feel free to pin this article on Pinterest, or follow our Québec City Pinterest board where we included links to all of the attractions mentioned above, plus several blog posts by other travel bloggers. #WeekendWanderlust, hosted by Chris & Heather from A Brit and a Southerner, Jessi & Tara from Outbound Adventurer, Ashley from A Southern Gypsy, Justin and Lauren from Justin Plus Lauren, and yours truly, is a collaborative effort to share travel blog posts, and to discuss all travel-related things. If the link up is still open, feel free to add a link to one of your posts below, then comment on at least three other linked up posts. If you leave a comment on this post, I will reciprocate with a comment as soon as I can! Also, don’t forget to join the #WeekendWanderlust chat on Twitter, every Saturday, at 11am EST, 3pm GMT, 11 pm SGT. See the list of upcoming topics on Travelogx. Than you, Nikoleta! I’m glad to hear that. I am planning my trip to Quebec, hoping to practice my French a bit there too! 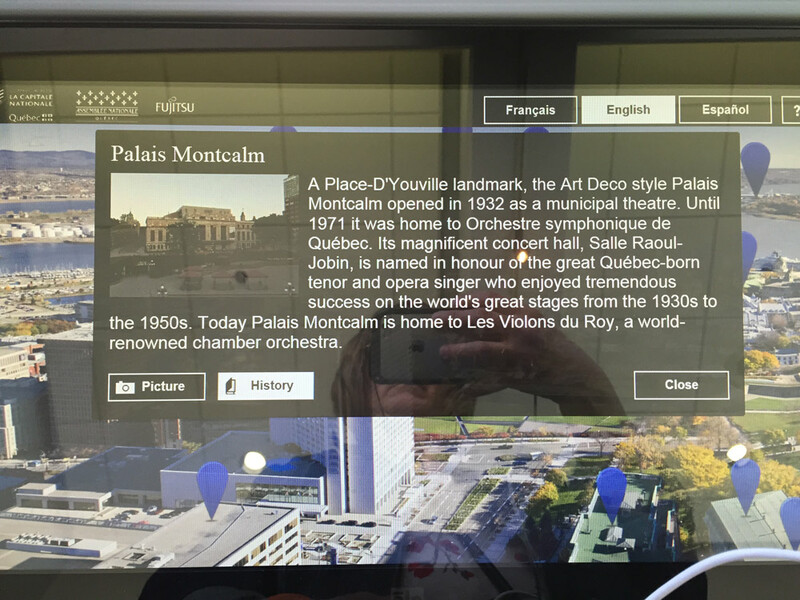 The audio pods looks fab… My kind of sightseeing haha! Thank you for reading, Sally! And yes, Quebec City is a much better place to practice French than Montreal, though most people are bilingual. Quebec City is beautiful! Thanks for sharing these views. Thank you for reading, Liz! I’m glad you liked the photos. We are going to Quebec in November so this is really valuable for us. Thank you for reading, Paula! I hope you’ll have a great time in Quebec in November, though it might already be a bit cold. It will still be lovely, though. Thank you for reading, Jennifer! I do hope you will visit Quebec City again some time. It’s worth the trip. What terrific views – and love the idea of those pods too. We love visiting cities and going up high. It gives you such a different perspective on it all. I love how the Observatorie provides so much history! I love trying to imagine what a city view might have looked like in the past! Hope to make it up to Quebec to ski this winter! Awesome view! :) I’ll be visiting Quebec City next year so I’ll go to the Observatoire de la Capitale for sure. That’s a lot of shoes produced! I have never thought of Quebec as an industrial centre. Bet your kids liked the listening pods (mine would be all over those). I think observation decks are really cool and always try to go if there is one in a city I am visiting. This one seems to really be worth the price, especially for all the information that is given. I’ve been to some that are extremely overpriced and have a lot less. I really like the touch screen panels too. Vicky and Buddy recently posted…Stonehenge: Is It Worth Seeing? Thanks for reading, Vicky & Buddy! You are right that some observation decks seem really expensive, compared to what they offer. I like to learn, so I appreciated the additional historical touch. Wow, what fantastic views you have captured! It would be wonderful to see it through the various seasons of the year as I bet the views change with the seasons. Hope to get there someday. Amanda & Brian – Eat_Work_Travel recently posted…Dear Florence, We Underestimated You! Thank you for reading, Amanda & Brian! And you are right, the photos from the Observatoire that I saw taken at different times of the year look amazing. I hope you will get to see Quebec City some time. It’s worth the trip. So I’ve been to Quebec City a few times and never knew this place existed! How could I let that happen. Looks like I’ll be making a trip back when I return to Canada. I love the idea of those listening pods. I always skip out on sitting to listen to something because the chairs look uncomfortable..but I would gladly curl up in those! Great list! I love that the Observatorie includes a bit of history and is more than just a pretty view. Thank you for reading, Brianna! Yes, the combination of history and the view is what makes the trip to the Observatoire worthwhile. Definitely a great view and a great way to see the layout of the city. And those egg-shaped chairs look pretty cozy! This makes me want to add Quebec to my list of places to visit. The view looks amazing and would make a weekend trip worth while. I have been to Quebec but missed this spot! you make it sound like a great place to visit- with or without the kids! Thank you for reading, Victoria! I like getting a bird’s-eye view of cities, just like I like bus tours, so I chose this attraction over a few others, because I wanted the views 🙂 The kids did like it too. I think it gave them a good perspective of how big the area is. Im headed to Montreal next week! I’m excited for the amazing architecture! this post just makes me more excited to get to Quebec! thanks for sharing!